Syrian government forces, supported by Russia, hit a hospital, blood bank and other medical facilities as well as a bakery and a school in towns and cities under the control of armed opposition groups in Idlib, in what appear to be direct attacks on civilian objects or indiscriminate attacks, Amnesty International said today after verifying six attacks. Over the past month, the Syrian government escalated its air strikes and artillery attacks on densely populated areas located on the strategic Damascus-Aleppo international highway in Idlib, known as M5. 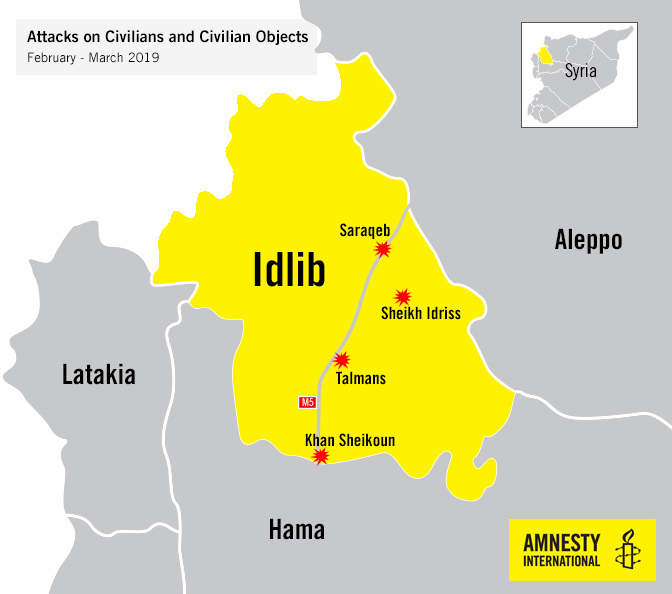 Amnesty International interviewed 13 residents who witnessed such attacks in Saraqeb, Khan Sheikhoun, Talmans and Sheikh Idriss in Idlib. The organization verified the witness testimonies through analysis of videos, open source information and satellite imagery. At least four civilians were killed and four were injured in these attacks. According to testimonies, the recent escalation in violence has displaced thousands of people to cities and towns close to the border with Turkey. “Eight years into the crisis, the Syrian government continues to show utter disregard for the laws of war and the lives of civilians. Military gains have been achieved at a great cost to civilians, leading to tens of thousands of deaths and the flattening of cities and towns. Russia and Turkey, as the key backers of the parties to the conflict, should heed the warning of the UN and ensure that the imminent offensive on Idlib prioritizes the protection of civilians and does not exacerbate the humanitarian crisis,” said Lynn Maalouf, Middle East Research Director at Amnesty International. “The ongoing attacks in Idlib fit the same pattern we’ve seen before, in Aleppo, Daraa, Damascus Countryside, whereby Syrian government forces hit hospitals, medical facilities, emergency responders, bakeries, schools, leaving people no choice but to flee. The Syrian government, with the support of Russia, is clearly resorting to the same unlawful military tactics which led to massive displacement, in some cases forced displacement,” said Lynn Maalouf. According to witnesses, Hay’at Tahrir al-Sham (HTS) and the armed groups operating under its umbrella are present in several cities and towns either on checkpoints, military bases, police stations, or they conduct regular patrolling of residential neighborhoods. Also, local councils run by civilians are believed to be, in some cases by force, affiliated, supported or guarded by the Salvation Government, established in 2017 by HTS. “HTS has an obligation to take all feasible precautions to protect civilians under its control, including by avoiding locating fighters and military objectives in the vicinity of concentrations of civilians. Recklessly placing what seems to be a military target in the proximity of medical facilities and within a populated area unlawfully endangers civilians and civilian infrastructure,” said Lynn Maalouf. On 26 March, Syrian government forces fired rockets at a school in Sheikh Idriss, east of Idlib city, around 8:30am during school hours. Two staff members in a field hospital in Saraqeb told Amnesty International that the attack had killed a 10-year-old boy and injured two other boys, ages 9 and 10, one of whom is in critical condition. According to residents, it appears that the rockets were launched from Abou Dohour military base located 20km away from Sheikh Idriss. There are no military targets in the school vicinity. In Saraqeb, on 9 March, Syrian government forces dropped four munitions in an aerial attack that struck al-Hayat hospital, a blood bank, an ambulance response unit, and Syrian Civil Defense, also known as the White Helmets – all located within 100 meters of each other – according to four witnesses. The witnesses said that the explosions caused serious damage to the structures and injured a staff member from the ambulance response unit. The al-Hayat hospital was shut down after the attack and patients in critical condition were transferred to other nearby hospitals while others were sent home, residents said. Witnesses told Amnesty International that two civilians – a 25-year-old man and a child – were killed on the same day in aerial attacks on residential neighbourhoods around 150 meters away from another field hospital. They said the escalation in attacks on residential and other civilian buildings in the past few weeks had displaced half of the population to the outskirts of Saraqeb into the farming fields or close to the border with Turkey. Amnesty’s Digital Verification Corps was able to corroborate many of these claims by video analysis, including the testimonies from Saraqeb residents regarding the 9 March attack on a blood bank and al-Hayat hospital on 9 March 2019. The organization also reviewed satellite imagery recorded on 17 March 2019 and identified Al-Hayat hospital and geo-located the probable blood bank close to the hospital using verified open source information, social media photos and videos. What is likely a large crater is visible approximately 100 meters west of the hospital in a field. Saraqeb is under the control of Liwa’ Jabhat Thuwar Saraqeb wa Rifouha [Brigade of revolutionary front of Saraqeb and countryside] which falls under HTS. Amnesty International also interviewed four residents from Khan Sheikhoun, south of Idlib, who said the vast majority of residents had been displaced after escalating air strikes and artillery attacks in February destroyed or damaged homes and other buildings, including two bakeries and medical clinics located in residential buildings. A civil defense volunteer said: “The al-Rawda bakery, the central bakery in Khan, was destroyed in an air strike attack on 11:30am… I removed the bodies of two men who died in the explosion in front of the bakery on street.” Residents stated that there was no longer any operational hospital in Khan Sheikhoun after an air strike attack had destroyed the only field hospital in the town in February 2018. The closest hospital is 20km away in Maarat al-Noman. “Deliberate attacks on civilians and on civilian objects, including hospitals and other medical facilities, and indiscriminate attacks that kill or injure civilians are war crimes,” said Lynn Maalouf. “Amnesty International calls on armed groups supported by Turkey in Afrin and Euphrates Shield Area to provide unfettered access to civilians fleeing the violence in Idlib. Turkey should open its borders to civilians wishing to flee and to humanitarian organizations providing impartial relief to civilians in need of assistance in parts of Syria under Turkey’s control,” said Lynn Maalouf.